I took a quick picture of this sticker book my mom gave my son before it became a little too well-loved, let us say. On the left is a sheet of stickers. On the right is notebook paper that has already been decorated by my son. This is one of the cleverest gifts my son received this Christmas, and it cost under $5 to make. 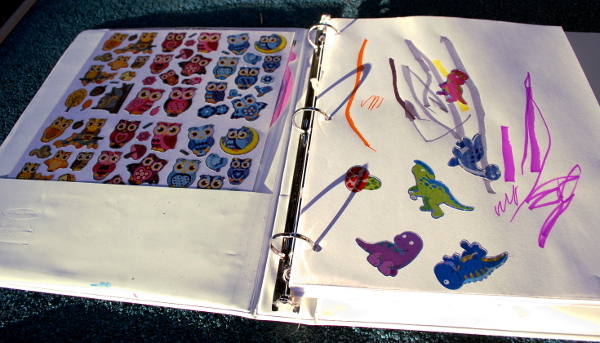 It’s a sticker book: a binder filled with blank pages, along with lots of stickers to put on the pages. My son, who is 2, loves this gift. He has spent long periods of time taking stickers and putting them on the pages, and then coloring all around his design. It’s great for creative development and a nice way to occupy him when I’m busy. Plus you can keep adding to the sticker as you go along by replacing stickers and pages as needed. All my mom did was get a white binder (she had one lying around–you can also frequently get them at thrift stores, unused, for under a buck) and fill it with white printer paper. Then she bought some stickers from the Dollar Store and stuck them in the envelopes on the front of the binder. So if you’re in need of a new activity–or a fun, creative gift–give a DIY sticker book a try.